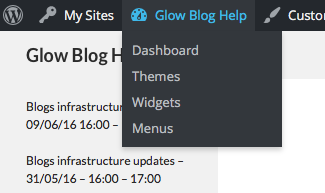 There are detailed instructions about adding a Widgets on Glow Blog Help. The Widgets Screen can be accessed from the Dashboard-> Appearance -> Widgets. From the dashboard section of the Admin Bar. You can also edit widgets in the customiser, but this feels a little cramped to me. One you are on the widget screen you drag the RSS widget onto the area you want it to appear on. The only setting that is mandatory is the RSS feed. Usually right (control) clicking on the icon and copying link will get the URL for the RSS feed. 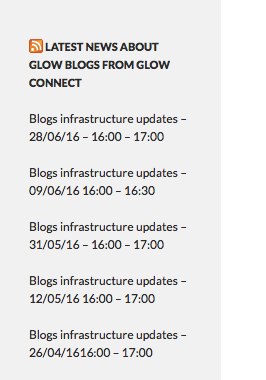 In WordPress blogs, like Glow Blogs you can use the Blog URL with /feed at the end. Once you have saved the widget settings the list of posts from the blog will appear on your sidebar.